Cutting the lawn is kind of a polarizing activity. Some people love getting out in the fresh air and cutting the lawn is a great opportunity to do that, but others see it as an ugly chore they have to perform. No matter where you find yourself on that spectrum you still have to have a mower if you have a lawn and in this article we’re going to take a close look at the best electric lawn mowers available today and we’ll offer our specific product advice in our electric lawn mower reviews. There are a few major benefits to choosing an electric mower over a gas powered mower. Probably the most obvious one is that they’re much better for the environment. In fact these mowers produce zero emissions so you can cut your lawn with a clear conscious all while breathing nice fresh air that isn’t polluted by your mower. In the first part of the article we’ll go over some key features you should be looking for when you’re on the hunt for a new electric lawn mower and we’ll identify which ones are the most important. In the second part of the article we’ll shift over to our electric lawn mower reviews and we’ll go into our top picks in the category in greater detail. If there’s something about the mower we don’t like we’ll tell you. If it’s got a known flaw we’ll let you know about that as well. There aren’t any perfect products out there and that’s why we identify any issues so that you can make a truly informed purchase decision. 1. Should You Go Cordless? 2. How Large is the Deck? 3. What Happens to the Clippings? 4. Can You Adjust the Height? All electric mowers have some fairly standard features and if they don’t you probably shouldn’t even consider them. Before we get into the reviews here’s a quick breakdown of the main features you should have in the back of your mind while you’re shopping around. Some may do better in one area or another so it’s always best to look at the complete package. Deciding whether to go with a corded electric mower or a cordless (battery powered) model is a big decision. It’s nice to not have to worry about a cord getting in your way, but you have to remember that a cordless mower will need recharging and that can happen at the most inconvenient time. With a corded model all you need is an available power source. One of the most important features of a lawn mower is the width of its cutting deck. The wider the deck the more lawn you can cut with each swathe. For a large lawn you should be looking for a mower with at least a 20 inch cutting deck, but for smaller lawns that’s probably not necessary and may even be a bit of a hindrance. When you cut your grass you will always produce a lot of grass clippings and you have different options for dealing with these. The best mowers have what is called a 3-in-1 feature. That means you can bag your clippings, mulch them, or discharge them on your lawn. We all have our preferences, but it’s nice to have the option to make the choice yourself. If you’re in the middle of a heatwave your lawn can become very dry and it’s normally a good ideal to leave it a little longer to shade the routes from the punishing rays of the sun. A good mower allows you to adjust the height for these types of situations and it’s definitely a feature you don’t want to be without. A lawn mower doesn’t need to be self-propelled. In fact, most of them are not. It’s a convenience feature that you normally find on some premium mowers and you can expect to pay a little more for these models. If you can afford it why not choose a self-propelled mower? It’s not a feature worth breaking the bank over – unless of course you have physical limitations that make it more of a requirement than a convenience. There are other features that you may want to look for when shopping for an electric mower depending on what’s important to you. If you have limited space you may want to look for a mower that easily folds up for storage and one that’s lightweight. If you’re worried about your physical health an ergonomic handle may be something you’ll want to look for as well. The GreenWorks 25022 is equipped with a 12 Amp motor that will give you that extra bit of pep you need to cut your lawn even if you’ve let it get a little bit longer. No worries if you let it get a little longer at the end of the fall season – when spring rolls around you’ll be ready to get that lawn back in shape with the ample power this mower provides. It also has a durable steel 20 inch cutting deck that exceeds the industry average and is another reason that this mower is one of the top rated electric mowers on the market today. With this larger cutting deck you’ll cut a larger swath of your lawn every time you make a pass. That means less time spent cutting the lawn on a hot summer day and more time for sipping on a nice cool beverage. We all have our own particular preferences when it comes to what we want to do with the grass clippings from the cutting process and this mower gives you options. It has 3-in-1 capabilities, which means you can bag, mulch, or discharge. The choice is yours. This is a corded mower so you will have to put up with dragging that cord around, but on the plus side you don’t have to worry about fueling it up and you’re not creating any emissions that can harm the environment. The 25022 is also one of the best electric mowers because of the amount of options it gives you for adjusting your cutting height. There are 7 different height positions you can choose from ranging from 1 ½ inches to 3 ¾ inches. This is important because you may want to adjust your lawns height level depending on the outside conditions to ensure it remains as healthy as possible. There aren’t too many complaints about this mower, but it does seem to have a bit of a tendency for the cord to work its way loose a little too easily. They could have also designed the cord to stay out of the way of the user a little better. Overall though, this GreenWorks mower is one of the best electric lawn mowers for a large garden because of its large cutting deck and extra amps. Sun Joe is a popular choice when it comes to affordability and reliability for outdoor gardening equipment and the MJ401E lives up to that reputation nicely. This is a powerful little electric mower with a 12 amp motor that will get you through most grass cutting chores with ease. Perhaps the only major disappointment with this mower is the narrow 14 inch cutting deck. You will have to make a few more passes with this mower to get the job done – especially if you have a large lawn. On the other hand, the compact size does make it perfect for smaller lawns and it’s great for storage if you don’t have a lot of room. It only weighs 29 pounds so if you need to lift it to store it on a shelf that shouldn’t be an issue either. The MJ401E does have a bag you can attach to capture the clippings if you like or you can opt to discharge your clippings back on the lawn if you prefer. Unfortunately it is not equipped with a mulching option. However, the small price tag might be enough to help you overlook that. The height can be adjusted depending on your preferences and the time of year. There are 3 different positions to choose from which is versatile enough for most consumers. It isn’t as versatile as some other models on the market though. There have been some complaints about the quality of parts on this mower – in particular the wheels. Admittedly it probably isn’t the most durable mower on the market, but with a little bit of care you should get years of use out of it. You have to remember this is marketed as an affordable compact mower – not as a top of the line mower for large lawns. This is one of the best small electric lawn mowers available. For those that want to shed themselves of the shackles of a corded mower without damaging the environment a cordless electric mower or battery powered mower is the best option. One of the best cordless electric mowers around is the EGO Power+. This mower may cost you a little more than a typical electric mower, but it is a premium mower with a lot of great features. This mower has a nice wide 20 inch cutting deck that will help to reduce the amount of time you spend mowing the lawn by cutting more grass with each pass. It’s a great choice for larger lawns and with a 56 volt lithium-ion battery it has the power for the job as well. The battery will typically last about 45 minutes to an hour on each charge, but it only takes about ½ an hour to charge so if you have a larger lawn you can take a quick beverage break while it recharges if necessary. The Power+ does have 3-in-1 capabilities for handling your grass clippings however you want. You can use the mulching option in the spring and when the weather warms up you can start using the bag to collect and dispose of your clippings. If you prefer to leave them on the lawn that option is available to you as well. It’s easily foldable for storage and it weighs in at about 65 lbs – not as light as a corded electric mower, but it does compare favorably to other cordless electric mowers. It’s a quiet machine and environmentally friendly of course. Perhaps one of the coolest features of this mower is its built-in LED headlights so you can cut your lawn in low light situations if you need to. The biggest complaints about this mower have to do with difficulties cutting longer grass and the cutting charge not being quite as good as advertised. Some customers claim you’re lucky to get 20 minutes on a single charge. Most reviews of this mower are pretty positive though and that’s probably why it’s the best rated cordless lawn mower. The Earthwise 60318 cordless mower is a popular choice for environmental enthusiasts that don’t want to sacrifice much when it comes to lawn cutting capabilities. This has a capable 24 volt battery that’s powerful enough for most average sized lawns. It’s packed full of features that you’d typically find on higher priced gas powered models and that probably explains the higher than average price tag. While it’s not the widest mower around it does have a decent size 18 inch cutting deck that will help you make short work of most lawns. What will make your lawn cutting duties much easier though is the fact that the 60318 is also self-propelled. All you have to do is put it in gear and guide it as it goes – no pushing required! There aren’t too many features missing from this mower at all. It also has 3-in-1 cutting options so you can also bag, mulch, or discharge your clippings with this model. Personally I prefer to bag, but if you just don’t like the idea of lifting a bag full of heavy grass clippings you don’t have to. It also has one of the longest lasting batteries you’ll find on a cordless electric mower with some customer claiming they can comfortably cut their lawn 2 or 3 times between charges. It does take a while to charge, between 12 and 15 hours, but that shouldn’t be a big problem as you can simply plug it in overnight and it will be ready to go the next couple of times you need to cut your lawn. The only other issue that you should be aware of with this mower is that it is heavy – even for a cordless electric mower. This thing weighs in at a whopping 90 lbs! It’s not something you want to lift with any regularity. It’s still one of the best cordless lawn mowers around though. The reason that many environmentally conscious consumers still prefer corded electric mowers over their cordless cousins is because of their ease of use. Sure the cord can get in the way, but you don’t have to worry about charging it and you always have available power when you need it. That’s why the Remington RM202A corded mower is still one of the top electric mowers on the market today. This mower has a competitive 19 inch cutting deck that mows a large swath of your lawn with each pass and it rarely has any difficult cutting through long grass with its 12 amp motor. That’s enough power for most consumers and this also happens to be one of the more affordable electric options out there. You can use the side discharge to deal with your clippings or you can select the mulch option, but it does not come equipped with a bag which is a little disappointing. However, they kind of make up for this oversight by including a 6 position height adjustment lever that you can adjust easily with one hand. That gives you complete control over the height of your grass. They haven’t forgotten about the users comfort either. The RM202A has an ergonomically designed handle with an extra cushioned grip that absorbs the vibrations from the mowers engine. It is a little heavy for a corded electric mower at 57 pounds, but that’s still pretty manageable. This is a reliable mower with a good reputation at the right price point. If you’re looking for a basic mower that gets the job done with no fuss this may be ideal for you. It’s nothing fancy, but it has some good features for its price range. Until I had the opportunity to review the Earthwise 60236 cordless electric mower I was under the impression that these types of mowers were always going to be a little more expensive than the average electric mower. It turns out this simply isn’t the case at all. This mower is one of the most affordable mowers in all categories. When I saw the small price tag I wasn’t expecting too much, but I was pleasantly surprised. The 60236 is powered by a 36 volt motor, which is capable of handling most jobs the average consumer will have in mind for it. 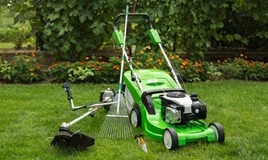 It also has a nice wide 20 inch cutting deck which is better than average and makes cutting your lawn that much easier. This mower has a nice comfort grip handle that will protect your hands from the motors vibration and any bumps along the way. The handle’s also set at a good height for the average person so you shouldn’t have to do any bending – unless of course you happen to be an NBA basketball player. The only thing that might cause you some excursion is if you try to lift it as it does weigh over 100 lbs and that’s surprising for an electric lawn mower with no internal combustion engine. This model does have 3-in-1 capabilities with a bag that tucks nicely in behind the mower when attached. You can easily switch it to mulching or side discharge if you prefer. The height can also be adjusted between 1.5 inches and 4 inches to manage the amount of clippings you create. This mower isn’t without its detractors though. The biggest complaint is about getting the battery to charge and in getting it to stay charge. By many accounts it could be better. The other major complaint is that the handle tends to come loose with repeated use requiring the user to continuously tighten it. It’s still one of the best electric cordless mowers – especially if you’re looking for an affordable cordless option. Worx is one of the best known manufacturers of outdoor gardening equipment. That reputation is built on providing quality products that consumers actually find valuable. The Worx WG708 electric mower is a good example of this. This mower has a powerful 13 amp motor that exceeds what most of its competitors offer and that’s helped to make it one of the best rated electric lawn movers available for purchase today. One of the few issues I have with this mower is its narrow 17 inch cutting deck. With a skinnier cutting deck you do have to work a little harder to get the job done, but they’re also ideal for small lawns. It really depends on what you’re planning on using the mower for. If you have a large lawn this may not be the best option. What I really like about this mower though are the extra little details they’ve thought of. Not only does it have the 3-in-1 functionality you’re probably looking for, but they’ve done it in style. The bag has a quick and easy release handle that also doubles as its carry handle for convenience. There’s also a hard plastic top on the bag which holds the clippings in better than other bags you may be used to. On top of that it’s also capable of holding 1.4 bushels of clippings at any given time. The WG708 also has a 6 position height adjustment lever to get your grass height just right. You don’t need any tools to adjust it – you simply lift the handle out and up and set it where you want it. It’s quick and easy. No mower is perfect and this one has its critics. The biggest complaint seems to be about the quality of the parts used in its construction. There are a lot of plastic parts on this mower and they do wear after a couple of years of use. Like anything else though, if you take care of your lawn mower you should get many years of great use out of it and that’s why it’s one of the best electric lawn mowers for the money. Few manufacturers have a better reputation for quality than Black & Decker and they’ve been bringing that reputation for quality to the lawn mower market for many years. The Black & Decker MM1800 is one of their most popular corded electric models and it also happens to be one the best corded lawn mowers in the field. This a good quality 12 amp mower and it’s also one of the more affordable options in its niche. It’s got a decent sized cutting deck at 18 inches that will be more than wide enough for most averaged size lawns, but probably not quite large enough if you have a lawn that’s pushing ½ an acre or more. This is a nice mid-sized model that can be used on different sized lawns. The real standout features of this mower are its easily foldable design and its light weight body. It only weighs 46 pounds so you can easily lift it for storage if needed. The height on this model’s also fully adjustable at the push of a button as well. In fact most aspects of the design of this mower were created with ease of use in mind. It has 3-in-1 functionality and the bag is included. Switching between bag and mulch is a simple process and of course you can choose to discharge your clippings on the lawn if you prefer. The mower also comes with a two year warranty as well. If there’s one consistent complaint about the MM1800 it has to be with how the height adjustments handle works. There are a few complaints about the handle slipping out of position while using the mower. That has the potential to leave behind an uneven lawn and is certainly a bit of a concern. Fortunately it doesn’t seem to be something most users have run into. This is easily one of the best electric push mowers you’ll find. There are many reasons to choose an electric lawn mower over a traditional gas powered mower, but the two main ones are probably to help reduce your carbon footprint and for convenience. 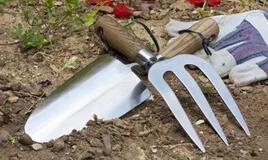 There’s no disputing the negative impact gasoline powered garden equipment can have on the environment, but there is some dispute over its significance. It’s up to each individual to decide if they feel strongly enough about the issue to make the switch. There’s also no denying the fact that an electric model can be a lot more convenient. Yes you have to dig out an extension cord or remember to charge the batter as the case may be, but you don’t have to leave home to go down to the local gas station to fuel up. Electric mowers are without a doubt more convenient. We’ve reviewed some of the best choices on the market for electric mowers in this article both corded and cordless and they’re all great choices depending on your individual needs. If we had to choose a favorite it would probably be the EGO Power+. This mower is cordless, fairly lightweight, and it has headlights which we just think is really cool! You really can’t go wrong with any of the choices in this article though.